We left McKinney around 9 am on Monday and made it to Waco around 11:15 with plans of stopping in and having lunch at Magnolia Table. Ummmm.... rookie mistake. Spring Break + Anything Magnolia = pure chaos. We took one look at the parking lot (and the lines wrapped around the building and booked it to Whataburger :) If we hadn't had kids with us we would have braved the wait but with three hangry kids on our hands it just wasn't worth it. It was pretty from the outside, though! ... it's a half glaze/half chocolate Texas sized donut. Yes, ma'am. We made it through about half before claiming defeat against the beast and decided to stretch our legs and burn off some sugar at a local playground. Joanne Land Playground was something that I had read about on the way down there as we anticipated wanting to make a pit stop and let the kids run a bit. It was AWESOME!!! It was really unlike any other playground we'd been to and the kids had a blast. We played for about an hour and then it was time to finish the last leg of our trip. An hour and a half later we arrived in San Antonio and were SO EXCITED about the view from our room. We stayed at Hotel Contessa and LOVED it! Highly recommend! It was a suite and shen you walked in there was a living room with a sectional that pulled out, a bar height table and dresser, tv, etc. There was a little hall with a bar and large bathroom and then a bedroom with a king size bed. It worked perfectly for us. We changed, got settled in a bit and then headed straight out to the Riverwalk. ... and the kids got to see their first riverboat. The weather was PERFECTION and we so enjoyed the walk to dinner. We decided to eat at Casa Rio (the first restaurant on the Riverwalk - they opened in 1946!) and spent the 45 minute wait for a table doing a bit of souvenir shopping. Griffin picked the LOUEST souvenir possible but I had to laugh because I had the exact same little drum when I was a kid. ... to try out the rooftop pool! The hotel had a heated pool and hot tub on the roof which was SO FUN! Looks like a GREAT day! That playground looks amazing!! Can’t wait for Day 2! Andrea! Oh my goodness! Just so many pics of your cute family!! And I'm still swooning over Mason's glasses ;) . What a fun trip! That donut is amazing! 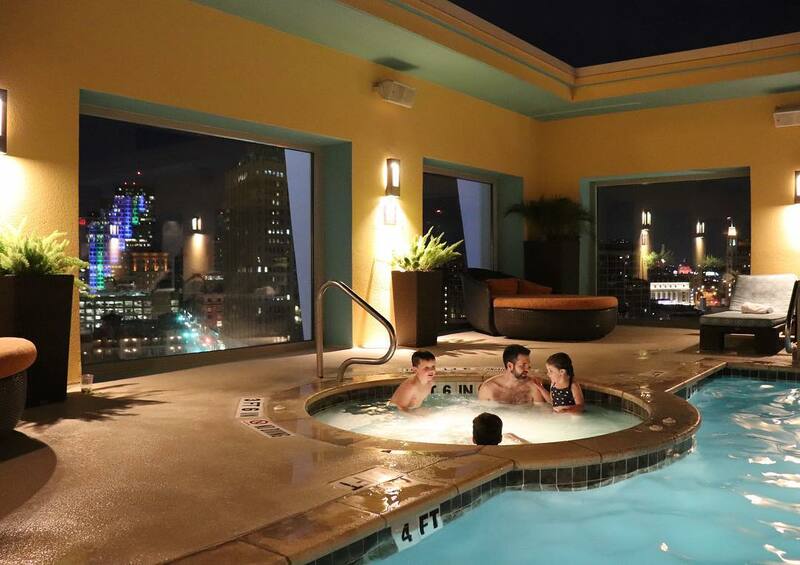 Totally haven't stayed at Hotel Contessa....but now I want to if only for a dip in the hot tub and that nighttime city view!! San Antonio is such a great place to visit. Love San Antonio! I haven’t made a trip to the Silos yet, but I am hoping to go soon. Just out of curiosity, how much does that donut cost? I have always wondered! Looks like a great first day! My husband and I stay at Hotel Contessa every year for my birthday! Highly recommend going in December as they have all the Christmas lights up and it’s absolutely beautiful! What a fun road trip! That playground is amazing. We always planned pit stops like that along the way when our kids were little as well. Sure helped with long car rides. We were in San Antonio a couple years ago so your pictures are bringing back some wonderful memories! What a fun day! I love the Riverwalk in San Antonio. I haven't been there since I was a teenager. I would love to take my family there one day! Yayyy!!! We are headed to SA on Wednesday, perfectly timed post!! Thanks for the tips!! That is your cutest vlog!! What a great spring break!! How much fun! We love San Antonio too! The Riverwalk is so unique! That room setup is just perfect for a family. Love that the sofa bed has a little extra room. With two teens, I am always looking for a good room layout to give everyone a little space. That donut looks like it belongs in my dreams!!! A road trip through Texas is on by bucket list. Taking notes:). Beautiful pictures! what kind is your new camera? Mine is getting old and after seeing the stunning quality of these photos I am convinced its time.